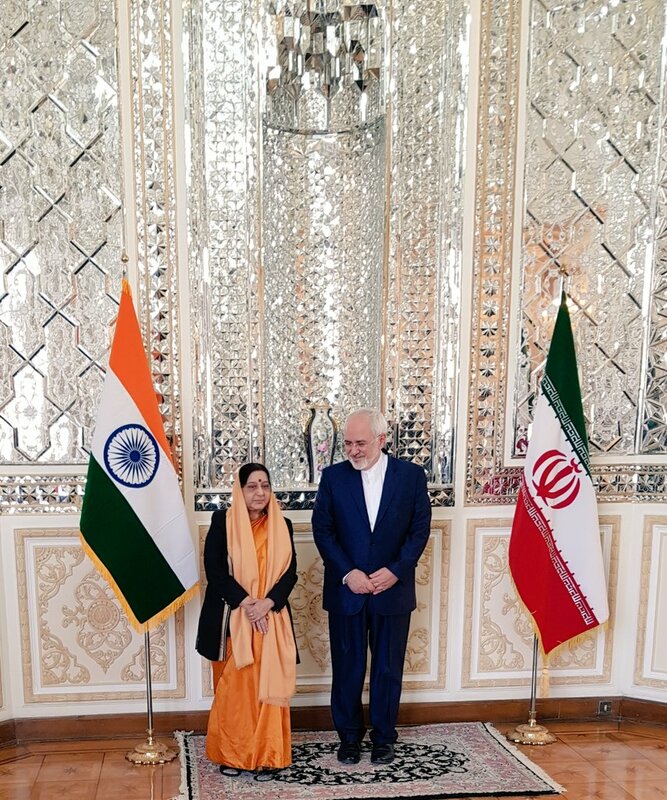 New Delhi, Dec 3: On the eve of the inauguration of the first phase of the strategic Chabahar port in Iran, a critical part of a trade route to connect to landlocked Afghanistan and beyond to Central Asia bypassing Pakistan, External Affairs Minister Sushma Swaraj on Saturday paid a visit to Tehran and met her Iranian counterpart Javad Zarif in Tehran. According to a statement issued by the External Affairs Ministry, Sushma Swaraj landed in Tehran on her way back from Russia's Sochi. Both she and Zarif discussed various aspects of bilateral relations and ways to strengthen it. The port is to be inaugurated by Iranian President Hassan Rouhani on Sunday. "Both sides positively reviewed the initiatives undertaken since the visit of Prime Minister Narendra Modi to Iran in May 2016, including cooperation in Chabahar Port which will be inaugurated by the President of the Islamic Republic of Iran Hassan Rouhani tomorrow in the presence of Ministers from India, Afghanistan and the region," the statement said. It said that Sushma Swaraj and Zarif also exchanged views on regional and global developments of mutual interest. According to Iranian media, during his meeting with the Indian Minister, Zarif said inauguration of the first phase, called Shahid Beheshti port, "indicates significant role of the port in boosting contacts and cooperation between countries in Central Asia with other countries in the world via the Sea of Oman and Indian Ocean". Zarif also hailed Tehran-New Delhi relations as good and growing. It is learnt that the Tehran meeting was held in the course of a "technical stopover" on Sushma Swaraj's way back to New Delhi from Russia. Sushma Swaraj was in Sochi to attend the 16th Meeting of the Council of Shanghai Cooperation Organisation (SCO) Heads of Government. Saturday's Tehran meeting assumes significance in the wake of media reports that Iran might hand over the management control of the first phase of the Chabahar port to India on Sunday, a year-and-a-half ahead of schedule. Indian Road Transport and Highways, Shipping and Water Resources Minister Nitin Gadkari is scheduled to attend Sunday's inauguration ceremony. The inauguration comes more than a month after the first consignment of wheat from India to Afghanistan was sent via Chabahar. It was the first shipment to go to Afghanistan through Chabahar after the trilateral agreement to develop the port as a transport and transit corridor between India, Iran and Afghanistan was signed by Prime Minister Narendra Modi with Iranian and Afghan Presidents Rouhani and Ashraf Ghani, respectively, in May last year to enhance connectivity between Central Asia and South Asia. In her address at the SCO meeting in Sochi on Friday, Sushma Swaraj, while stating that connectivity with Afghanistan was an important priority sector for India, said that this has improved with the operationalisation of an air freight corridor between Kabul, Kandahar and New Delhi in June this year.